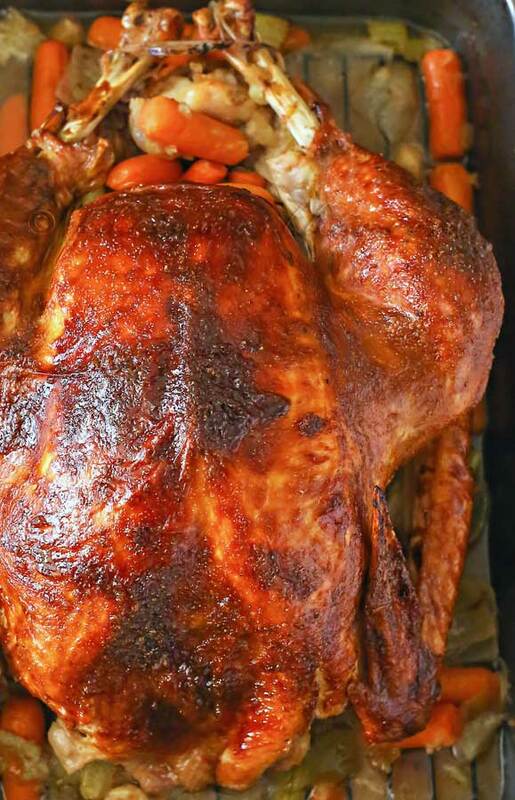 Easy, simple & delicious recipe for How to Roast a Turkey will have your guests swooning. It’s not complicated & turns out perfect every single time. YUM! This time of year it seems that most people really dread making that turkey. Especially if they are hosting the holiday feast & they are responsible for feeding the masses a delicious bird. I know it can seem so overwhelming & if you let it, it can be. For our first few years together our Thanksgivings were a disaster. We had times where we were trying to cook a half-frozen bird, times where we basted it so much that it just wouldn’t cook because we opened the door so often. I’m telling you – it took a while for us to figure it out. But I would say out of our 20 years together – the last 12-15 we have been using this recipe for the turkey & it’s perfect every time. So I’m here today to tell you that it can be simple. 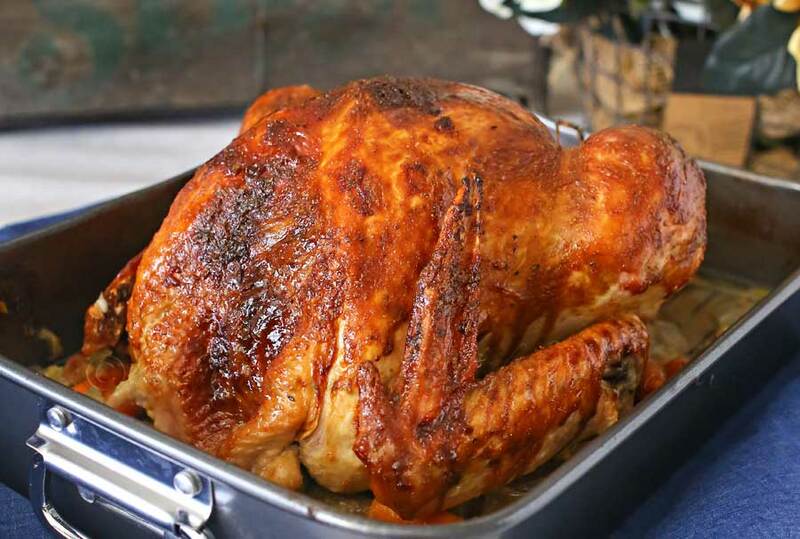 In fact, after we perfected this recipe- we started making a turkey multiple times a year. It doesn’t have to be just for Thanksgiving, that’s for sure. 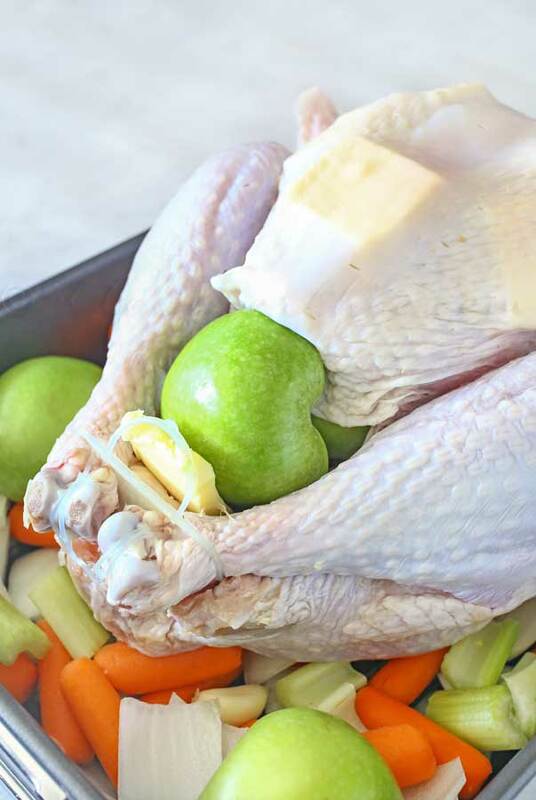 Let me show you just how easy it is with my How to Roast a Turkey tutorial! 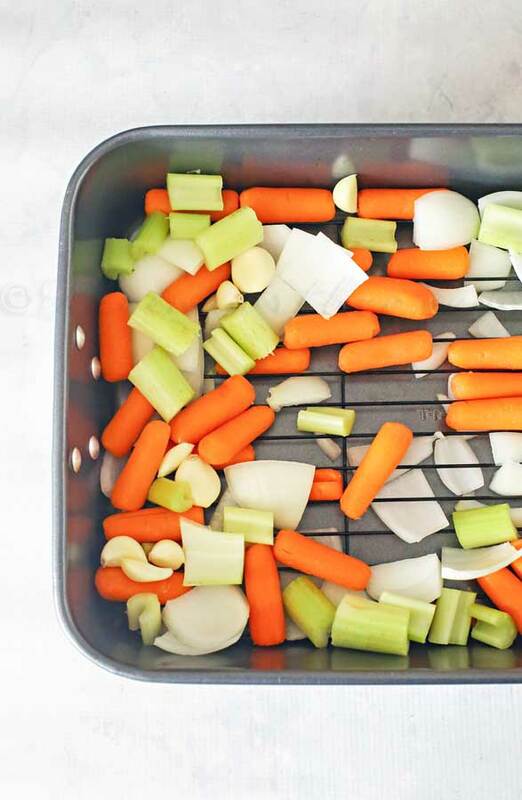 Cut your veggies & add them to the bottom of the pan. I prefer to use a pan with a rack to keep most of the bird elevated from the moisture. You don’t want a soggy bottom of the bird. 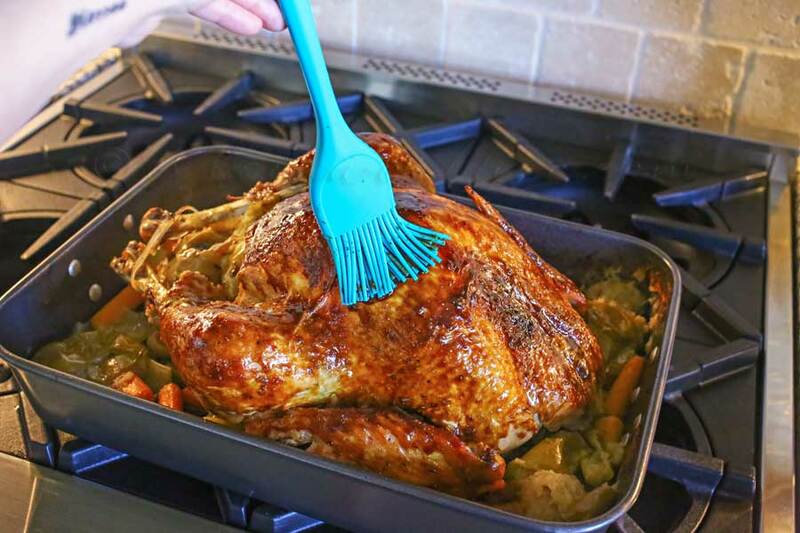 You can pick up a pan like this for about $10 at Walmart & it holds up to about 15 lb turkey. 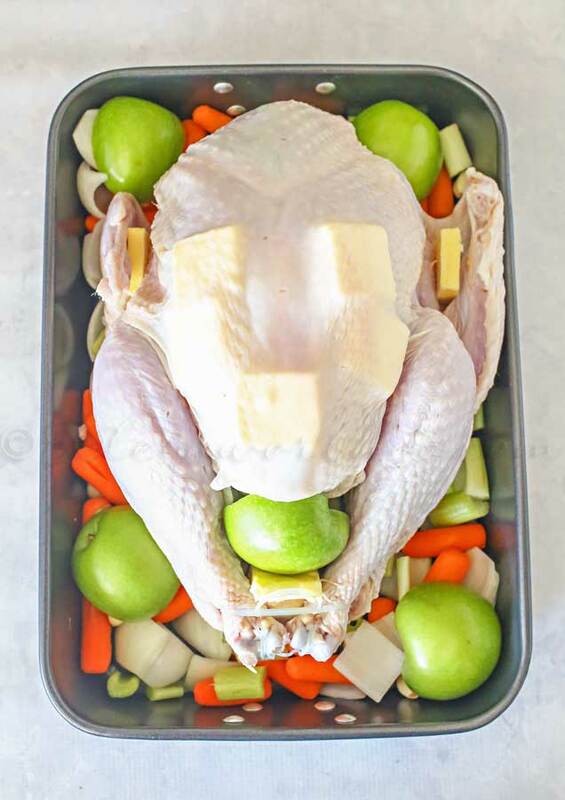 Add those same veggies to the inside of the bird. Keep it simple because you can’t eat stuffing that was inside a raw bird anyway. I also like to add butter between the skin & meat to help crisp the skin & it’s so yummy. I also like to add apples. It gives a wonderful flavor. 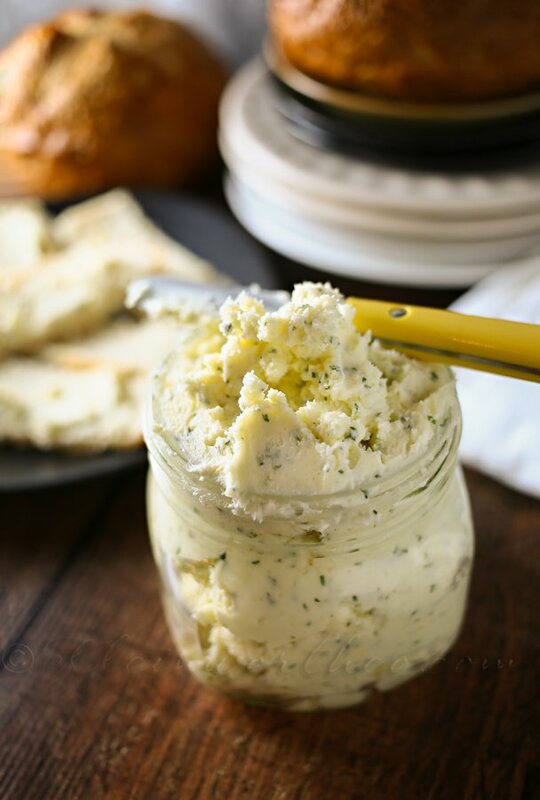 My favorite part – I add some of my Italian Garlic Butter to the bird. Just melted & bushed on all over. I don’t add any other seasonings at this point because I have found they tend to burn. The glaze is where the flavor is at. I bake for a while uncovered to get that skin to start to crisp. Then I cover & continue to cook. When you get close to the recommended cooking time for the size of your bird it’s time to check the temperature. 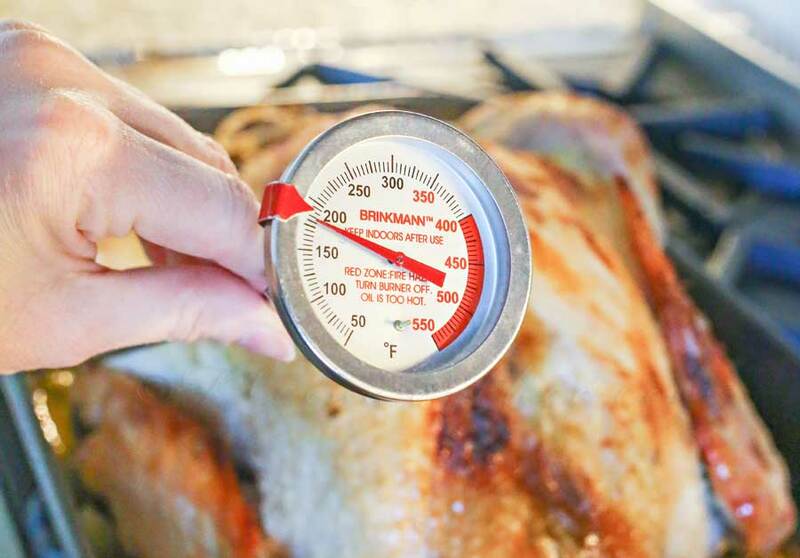 Stick your thermometer into the thickest part of the bird & make sure it’s at least 165 degrees. Once you have reached the right temperature, it’s time for the glaze. Combine the ingredients, brush on & return the turkey to the oven for a little while longer. Once your glaze is set – you are good to go! See – it’s easy! You can totally DO THIS!! Now you can ROCK your Thanksgiving!!! 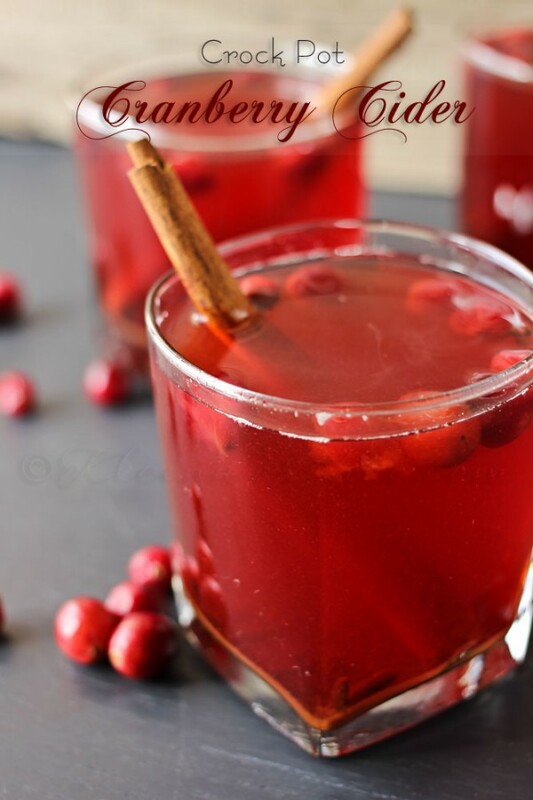 Looking for more great Thanksgiving recipes? 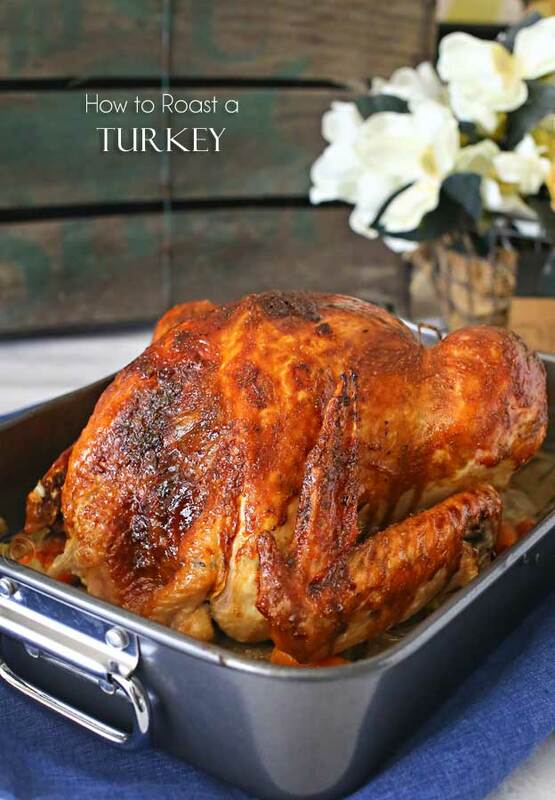 Easy, simple & delicious recipe for How to Roast a Turkey will have your guests swooning. 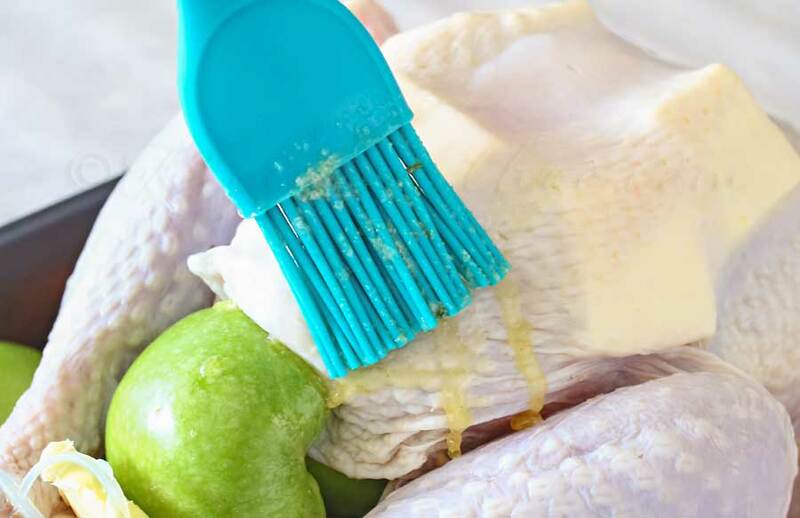 Prepare your turkey by removing the added items (neck, giblets, gravy packet) - no need to rinse the turkey- leave the tie on the legs - this helps keep it together. That is stunning!! I bet it tastes amazing. Hi, for the glaze you mentioned molasses,is it carob molasse or something else. Thanks for your question. It’s just regular unsulfured, full flavor molasses. I have added a link to where I buy it on Amazon in the widget at the bottom of the post so you can see what I’m using. 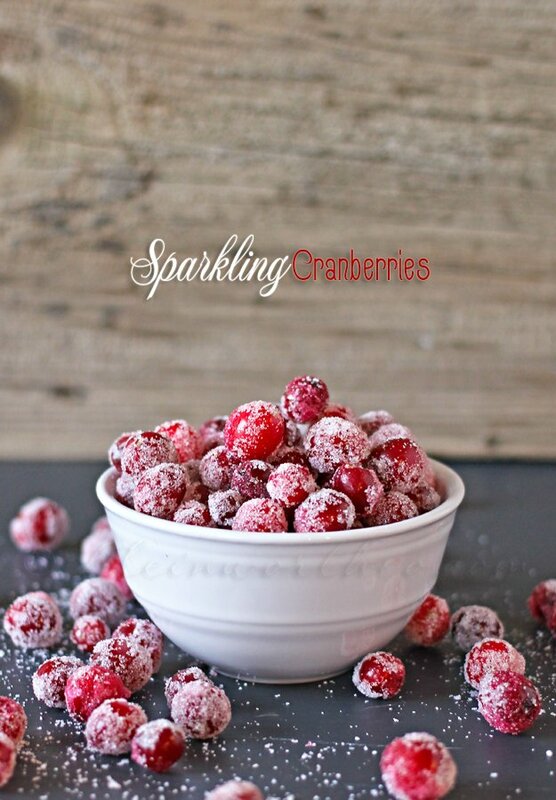 Stopping by from the home matters linky party ! nice to meet you! May I use this lovely post in a recipe round up ? thanks so much ! Thanks Sharee- one image with a text link back to the post is perfect. Thanks so much for wanting to share & asking me. Hope you have a wonderful weekend. Oooh I’m going to have to try this molasses glaze this year! YUM. Love that you use butter and apples- I do as well! 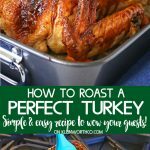 I LITERALLY just made my very first roast turkey a couple weeks ago, and used this recipe during my research on how NOT to screw it up! Thank you!!! I’m surprised at the high temperature. I’ve always cooked it 20 min a pound at 325 but this recipe looks worth the try. Thank you. That is true – but most of the cooking time is at the reduced temp- but still higher than your recipe. Looks delicious! We converted to grilled Turkey a few years ago and never looked back. 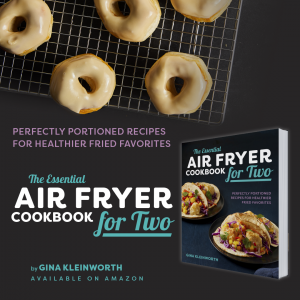 But if it’s ever too wet to grill, I’ll definitely look back to this recipe!